Clearly split, but tight with noticeable difference in brightness. Very nice view. Both Well split, relatively tight with noticeable difference in brightness. 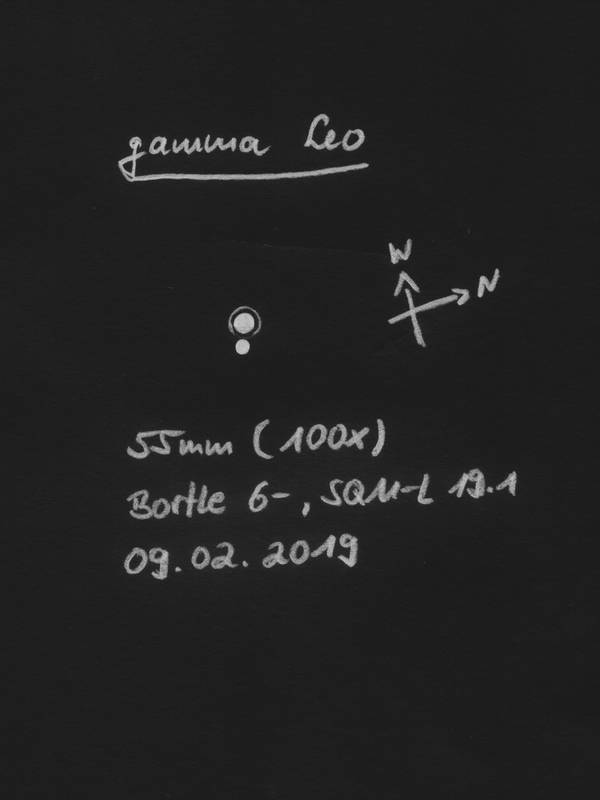 SQM-L 20.8: Nice double star with big difference in brightness. The two components are 30 and 31 Cyg (omicron 1 Cyg). Wonderful double star for binoculars. Large distance of the components, brighter once (31 Cyg) appeared slightly orange, the fainter (Cyg 30) more bluish. Brighter component is 31 Cyg (omicron 1 Cyg). Observation at full moon. Easily split with big difference in brightness. Brighter component slightly orange. C-component rather faint. Similar to the observation with binoculars. C-component appeared bluish and gave good contrast to the orange colored 31 Cyg. Separated, but very tight. I used a tripod. Well split with noticeable difference in brightness. 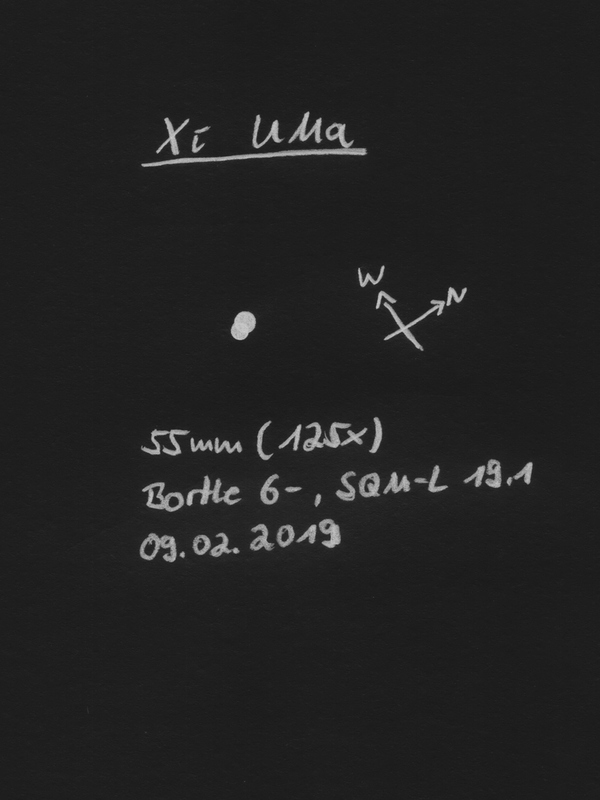 SQM-L 20.1: Well split at 80x. Brighter component appeared white, fainter one slightly orange. 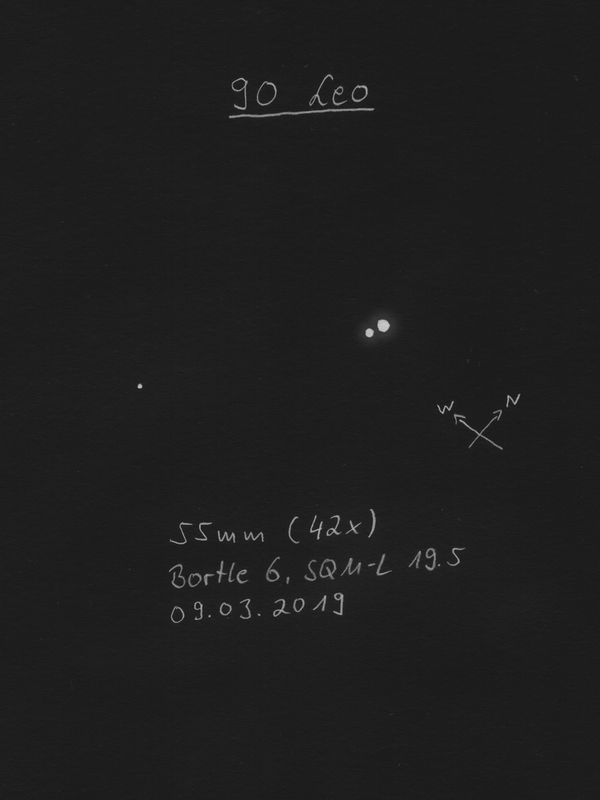 SQM-L 20.5: Very nice, evident double star with equally bright components. Beautiful view. Easy to separate with components of the same brightness. It is noticeable that there are no brighter stars in the immediate vicinity, so that the double star stands out very well. 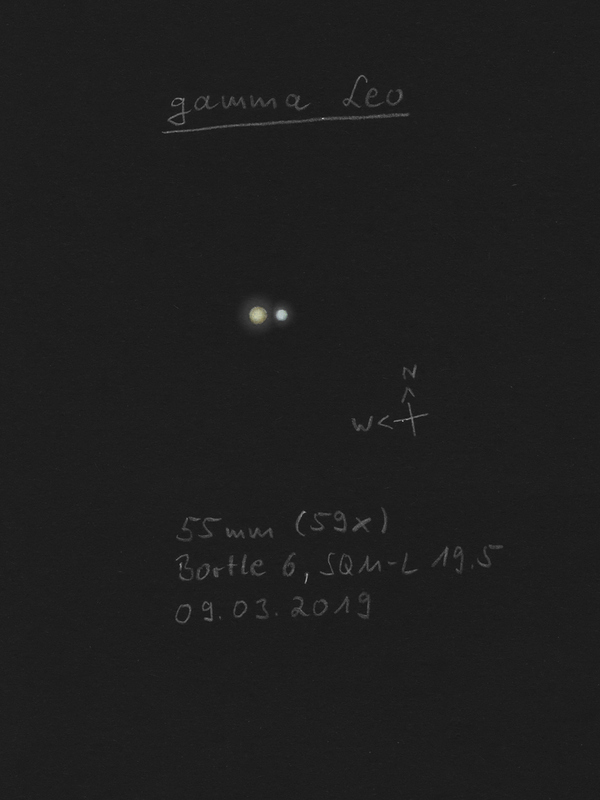 Beautiful double star, relatively tight with visible difference in brightness. Well split, but I didn't recognised any color. One of the most beautiful double stars in the northern hemisphere. Differences in brightness and color (orange-blue) are brilliant! Even under urban conditions with small aperture an enjoyment! Easy to split with little difference in brightness. Relatively large angular distance with obviously fainter component. Large distance with significant difference in brightness. Not split. I probably didn't recognised the fainter component. The angular distance shouldn't be a problem. Easy to split with big difference in brightness. Fainter component appeared deep orange to slightly red colored, brighter component tends to be more slightly yellowish. Nice, obvious double star. Both components have similar brightness and appeared white. Easy to split with large distance and difference in brightness. Almost equally bright components with large angular distance. Evident, easy to split at large angular distance. Brighter component appeared very orange, fainter one bluish. The brightness of this double star does not match the data in the WDS. I also couldn't separate anything here. A mistake in the WDS? At 128x I was able to see this double at least elongated. Quite well split with noticeable fainter component. I guess it is just an optical double star. At least I could not find any entry in the 'Washington Double Star Catalog' (WDS). Located west of the globular cluster NGC6935 in an angular distance of less than 10 arcminutes. Even at high magnification there are no indications of a double star. Also the brightness seemed to be less than stated!? Well split with visible difference in brightness. Components equally bright, easy to split. At 57x elongated, at 100x barely, at 128x clearly split with noticeable difference in brightness. Clearly split with equally bright components. Clearly split with visible difference in brightness. Easily split with big difference in brightness. At 100x partly split, otherwise '8'-shaped. At 128x clearly split. Difference in brightness noticeable. Easily split at 20x. From 44x the brighter component was orange colored, the fainter one tends to be more bluish. At 57x barely split with noticeable difference in brightness. At 128x easy split. Clearly split, tight, apparently equally bright components. Split with equally bright components. At 44x almost split. At 57x equally bright components visible. Easy to split with quite large difference in brightness. Not split, but partially seen as an '8'. Overall the double star appeared rather faint and both components seemed to be similarly bright. Barely split with slight difference in brightness. Well separated with noticeable difference in brightness. Easy to split, large distance, noticeable difference in brightness. Both components well seen with noticeable difference in brightness. Not separated. The diffraction disk showed again and again irregularities, which indicated a double star. Easy to separate with relatively large difference in brightness. Barely split at 18x. At 40x difference in brightness is visible. Nice view together with the double star STFA7 located northwest. At 40x barely split. At 75x easily split with visible difference in brightness. 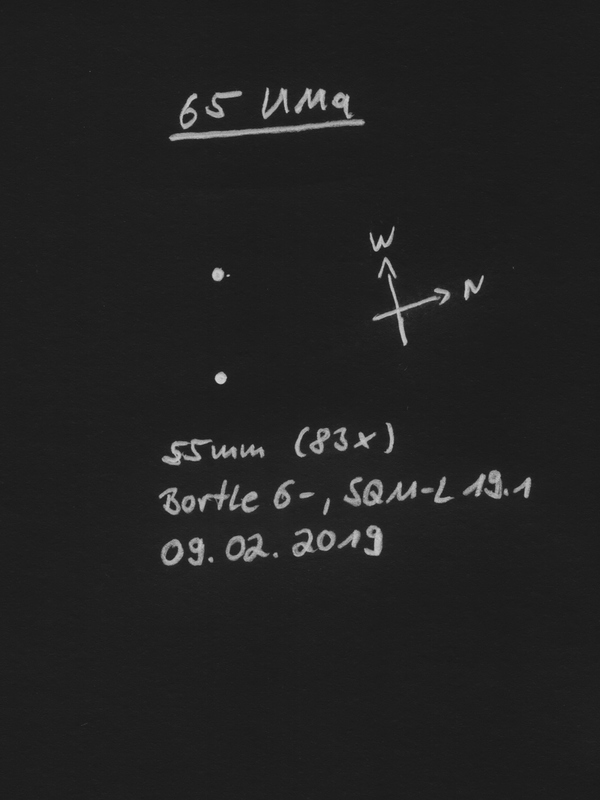 Easy to separate, but much fainter, second component, which appears as a small, faint spot. Nice view. Nice, evident double star, easy to split. Slight difference in brightness. 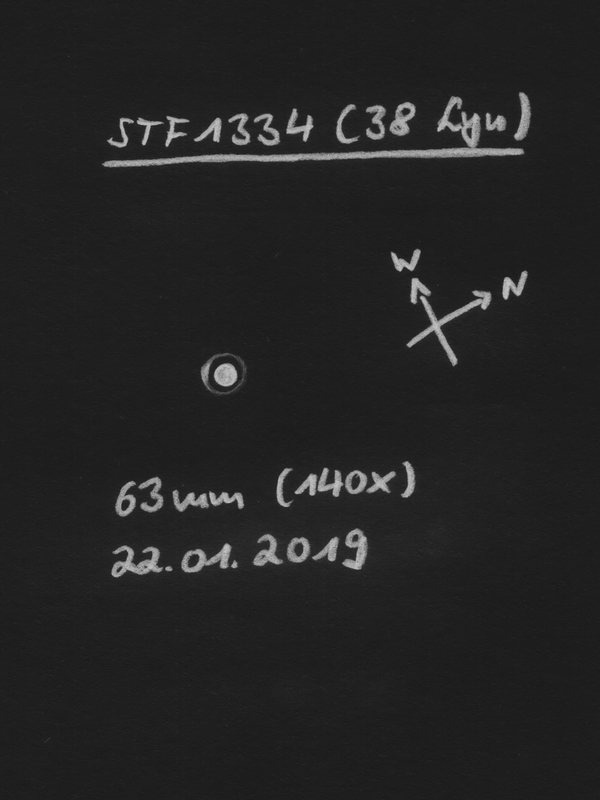 At 44x fainter component seen as fine star close to the primary component. At 57x wonderful view! Overall easy to split. At 40x tight with obviously fainter component. Separated, but tight with noticeable difference in brightness. At 44x barely split. At 100x easily split with obvious difference in brightness. At 40x slightly elongated, at 38x separated, but tight. Overall faint with components of similar brightness. Split, no difference in brightness and color. Very nice! The second component was immediately seen as faint companion. 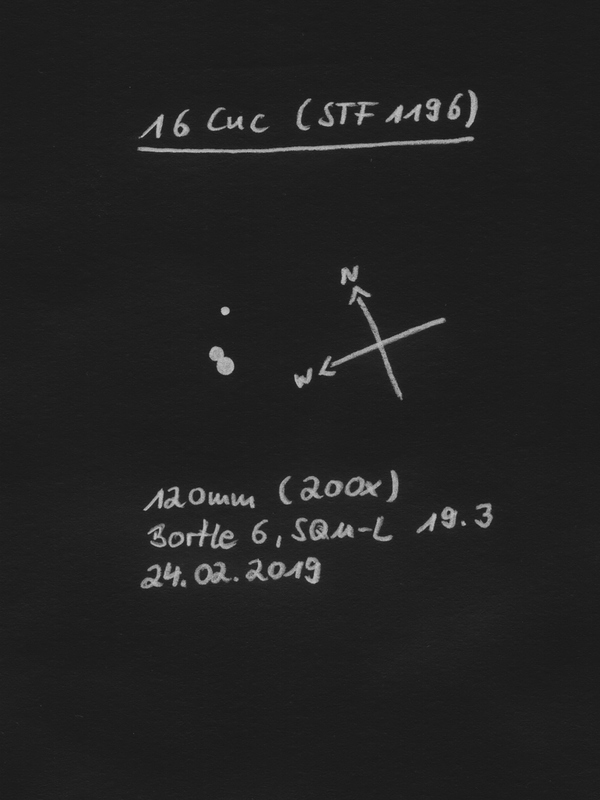 First attempt at 133x: much fainter component clearly visible as a tiny star at a relatively large distance. After that the visibility was easy even at 67x. At 44x the faint component could only be guessed. Well separated with visible difference in brightness. Clearly split with decent angular distance. Components appeared nearly equally bright. Well separated with slightly fainter companion. At 44x split, but very close together. At 100x clearly split with nearly equally bright components. At 33x very tight with visible difference in brightness. At 47x very nice view. Both components appeared white. Easy to split with similarly bright components. Nive view. At 57x split with almost no space in between. At 100x clearly split with noticeable fainter component. 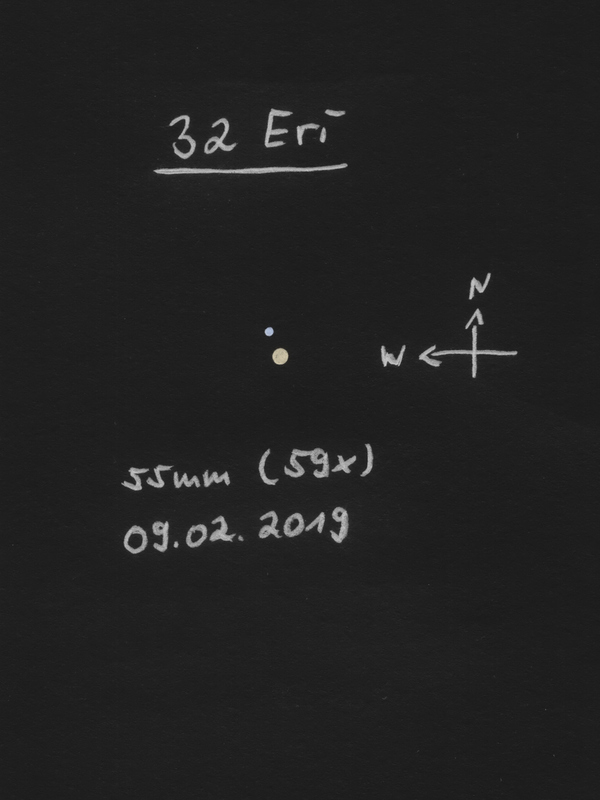 Located about 0.5 degree east of Messier 1. Nice, evident double near Messier 1. Easy to split with almost equally bright components. Nice double star with nearly equally bright components. Easy to split with large distance and noticeable difference in brightness. Big difference in brightness. I could see the fainter component near the first ring of the Airy pattern of the brighter component. Well split with noticeable fainter companion. Relatively tight with visible difference in brightness. Well split with obvious difference in brightness. Well separated with significant difference in brightness. Well split, but close together. Little difference in brightness noticeable. Separated, but tight with visible difference in brightness. Relatively large distance and clear difference in brightness. The lighter component seemed white-yellowish, the weaker one slightly greenish-blue. The color contrast, however, was not particularly conspicuous. At 40x tight, at 55x well split with obviously fainter companion. Unfortunately a nearby lamp bothered me. I could see the double star at least elongated. At 27x pretty tight with much fainter component. At 71x clearly separated with clear difference in brightness. Brighter component appeared slightly yellowish, the weaker one slightly bluish. Easy to separated with noticeable difference in brightness. The fainter component appeared slightly orange, the brighter one rather white. Well separated, large distance, slight difference in brightness. Large difference in brightness. The fainter component was well separated, but just a very tiny star. Unequal pair. At 22x very tight, at 44x well split. Fainter companion appeared slightly orange, brighter one white-bluish. At 57x barely split with noticeable difference in brightness. At 100x well split, but still tight. At 44x the double star appeared as an '8'. At 100x clearly split with noticeable difference in brightness. Both components appeared white. Easy to separate with quite clear difference in brightness. Easy to separate. A: light gray, B: pale orange. Evident difference in brightness, easy to split. Both components of similar color. Very tight. The Airy disks were still touching. Slight difference in brightness. Extremely beautiful triple star! Grand sight! Pretty wide apart and unequal. A: decent orange, B: very nice light blue. Components similar in brightness, pretty faint, close together, but clearly split. Very beautiful view with moderate distance and difference in brightness. A: glossy, light orange, B: white- bluish. Well split with obvious difference in brightness. Fainter component appeared bluish, the brighter one slightly orange. Beautiful view. Clearly unequal with nice angular distance. Primary component appeared in pale yellow, secondary component silvery-white. Well split with big difference in brightness. Easy to split with noticeable angular distance and slight difference in brightness. The faint component tends to be more bluish, the brighter one appeared more light yellowish. At 108x elongated, at 150x barely split with similarly bright components. At 28x barely split with visible difference in brightness. At 62x easy to separate. The colors seemed similar. The fainter component was seen as permanent brightening on the first diffraction ring of the primary component. Easy to split, whereby the much fainter component lies on the first diffraction ring of the primary component. The primary component itself appeared slightly yellowish. Easy to split, very unequal. A appeared in pale orange, B was visible as a very tiny, gray star on the first diffraction ring of component A. At 85x the fainter component was easily visible but not separated. At 192x well split. The fainter component was almost on the first diffraction ring of the primary component. Quite big difference in brightness. I did not looked at the color of the components. At 86x pretty tight and unequal. At 160x clearly split. A: white, B: slightly orange. At 28x, the B-component appeared rather faint and pretty close to the primary component. At 62x both components were clearly visible and unequal. A: slightly orange, B: grayish. At 44x elongated, partly with constriction. At 67x split, but very tight. A difference in brightness was not seen. At 133x clearly separated with little difference in brightness. A appeared pale yellow, B rather warm-white. Beautiful view! This triple system includes STFA 28 and STF 1938. Rather wide pair, equal without visible difference in color. Nice double star, well split with equally bright components. At 28x very tight and barely split, unequal. At 86x very nice view. No difference in color: both components appeared white. Very nice double star, well split with noticeable difference in brightness. 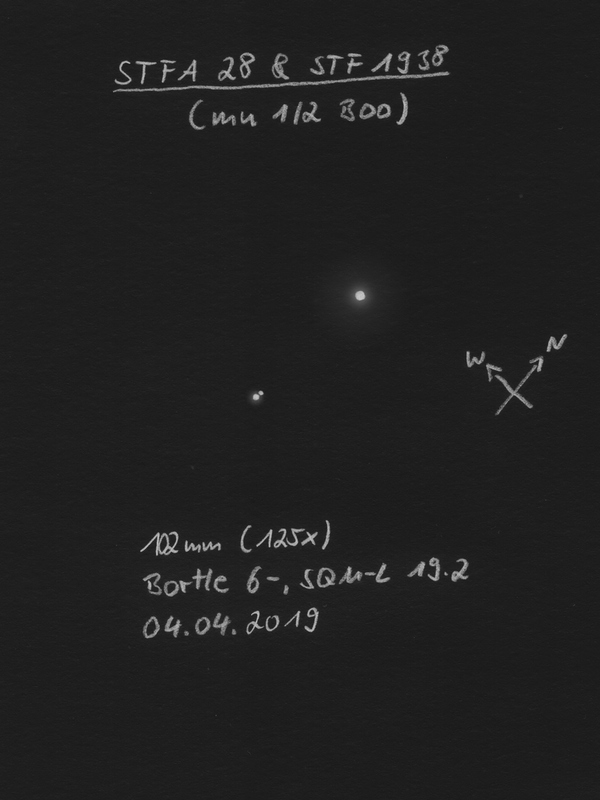 Nice double star, easy to split with noticeable difference in brightness. 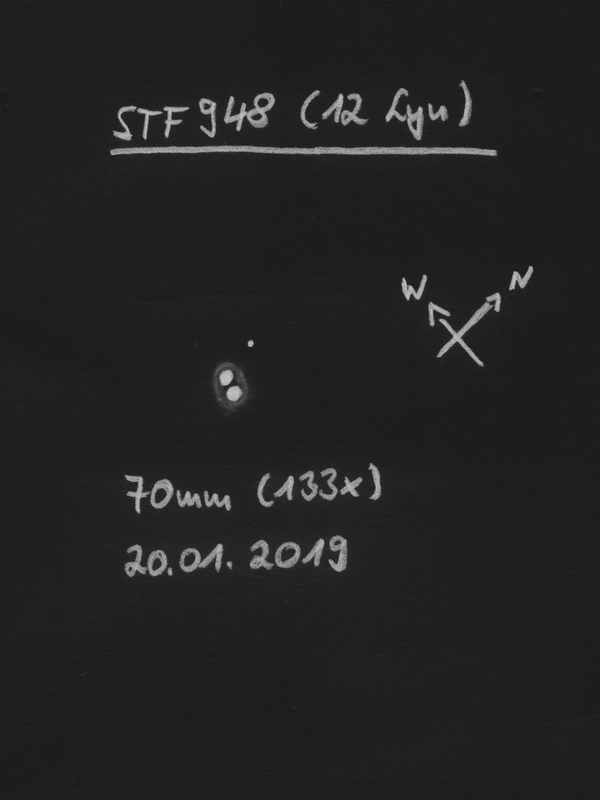 Only 11 arcminutes northwestward is the pretty bright planetary nebula IC4593. SQM-L 20.6: Split at 40x with obvious difference in brightness. At 75x easily split. At 187x clearly elongated, partly visible as '8' with slight difference in brightness. At 280x two distinct, slightly overlapping Airy disks visible. At 90x seen as '8', at 125x clearly split. At 90x barely, at 125x clearly split. 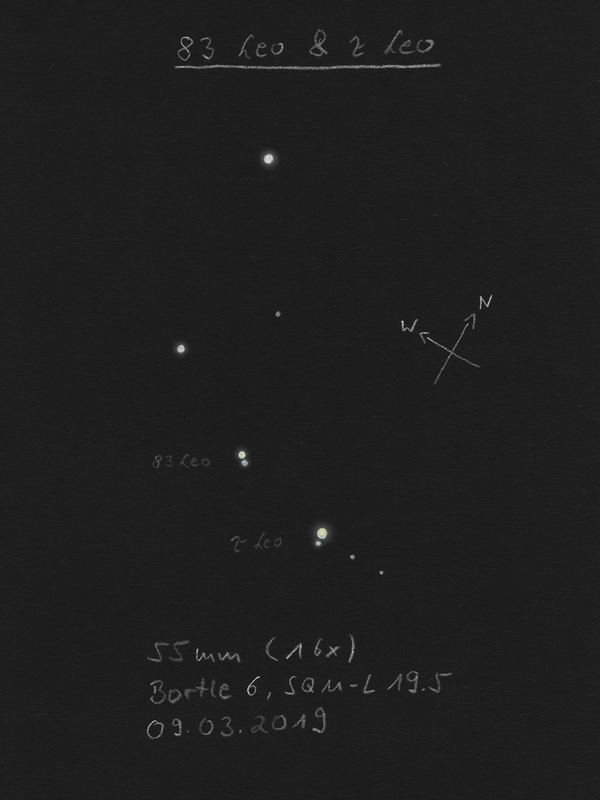 NELM 5.4+, SQM-L 20.6: Evident double star with almost equally bright components and no noticeable contrast in color. Barely split without any noticeable difference in brightness. Striking double star with clear distance and difference in brightness. Easy to split with equally bright components. Easy to split with visible difference in brightness. Stands out immediately. At 55x split with noticeable difference in brightness. At 83x very well split with significantly fainter component. At 25x elongated, at 40x split, but tight. At 55x well split, almost equally bright. At 25x split to some extend. At 40x well split with noticeable difference in brightness. Split, tight, nearly equally bright. At 83x seen as '8'. From 100x to 166x seen as '8', temporarily visible with space between. Wonderful double star. Easy to split with slight difference in brightness. Easy to split with noticeable difference in brightness. Brighter component appeared slightly orange, fainter one bluish. Large distance with visible difference in brightness. I used a tripod. Well split with noticeable difference in brightness. 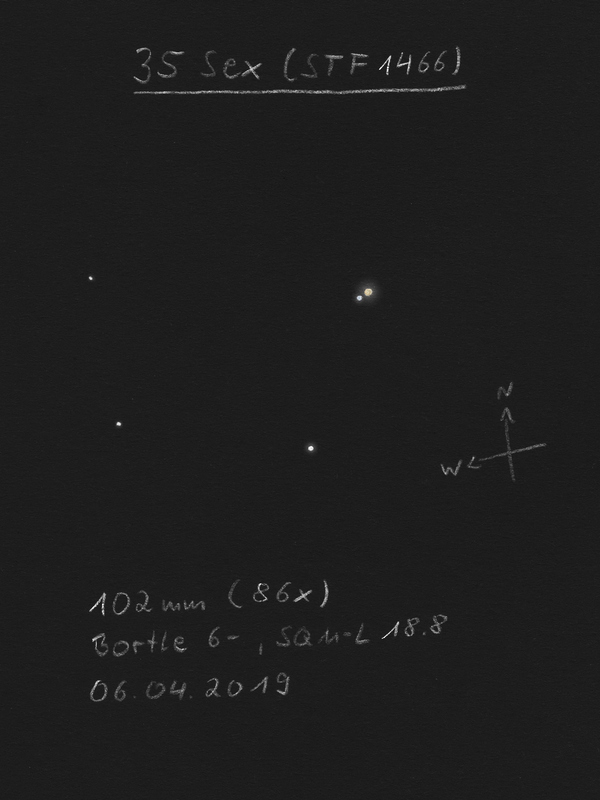 Nice view together with the double star STF401 located southeast. This double star contains of the components 15 and 17 CVn. Both components similar in brightness with large distance. Easily split with obvious difference in brightness. Evident, very wide apart and unequal. A: white-yellowish, B: gray. Easy to split with large angular distance and noticeable difference in brightness. Observation at nearly full moon: Fainter companion was not visible. 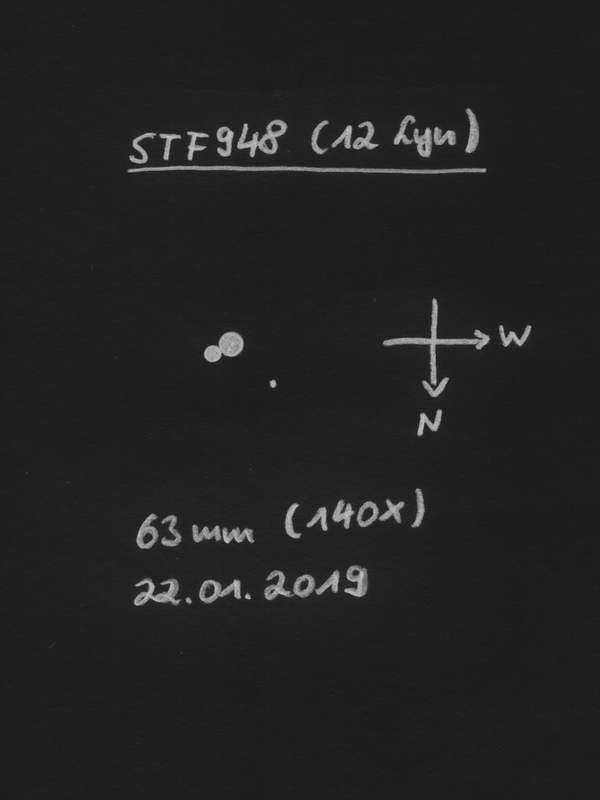 Although the optics were not yet completely cooled down, the fainter component could be seen slightly outside the first diffraction ring as a tiny star in moments of steady air. Wide, moderately unequal pair. Little difference in color: Primary components appeared a bit more orange colored. The fainter component was visible as a permanent brightening of the first diffraction ring. At 57x nothing seen at first sight. 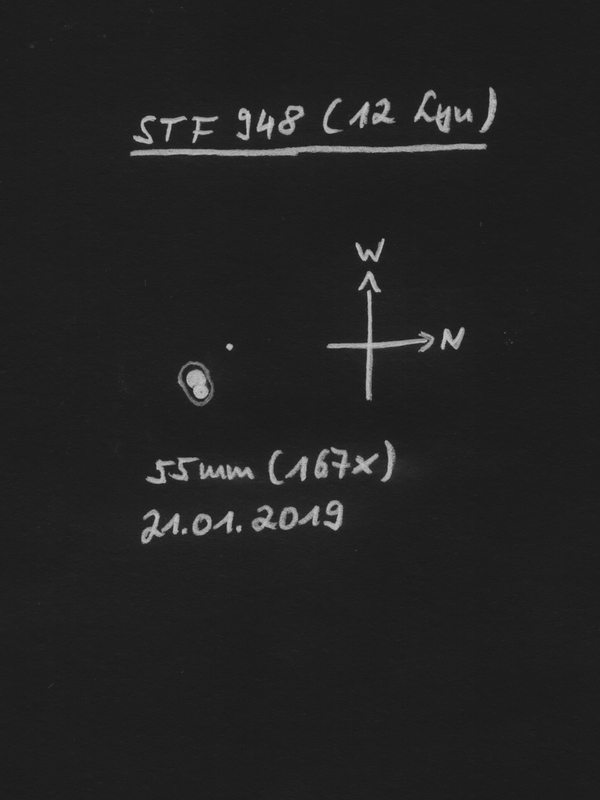 At 133x the much fainter component was visible after a short time as a tiny star in the correct position angle. 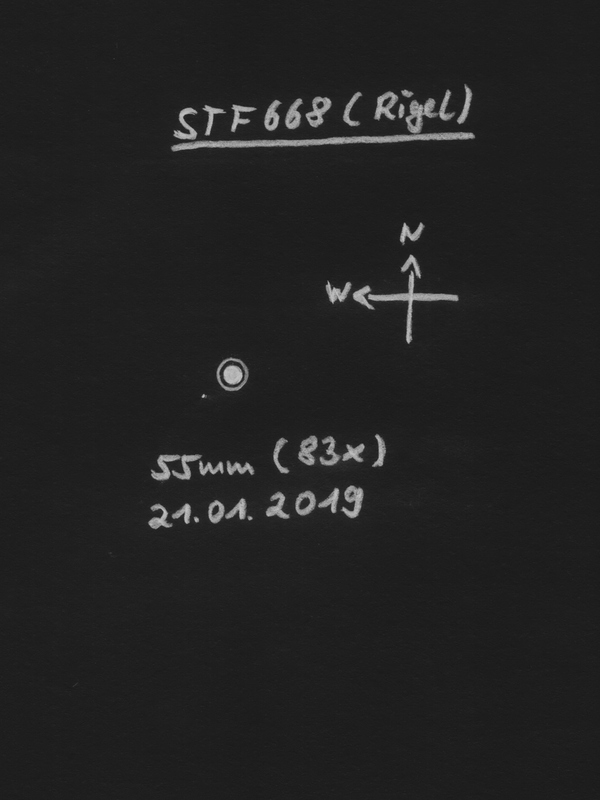 With this knowledge, the observation at 57x was also successful, even if one has to look very closely. The challenge here is not so much the angular distance as the large difference in brightness. Split, but very tight with equally bright components. I used a tripod. Easily split with nearly equally bright components. Located in the center of the open cluster NGC1502. Very nice view. Clearly split with nearly equally bright components. Nice double star. Brighter component appeared orange, the fainter more bluish. Visually evident as double star and easy to find. Well split with slight difference in brightness.